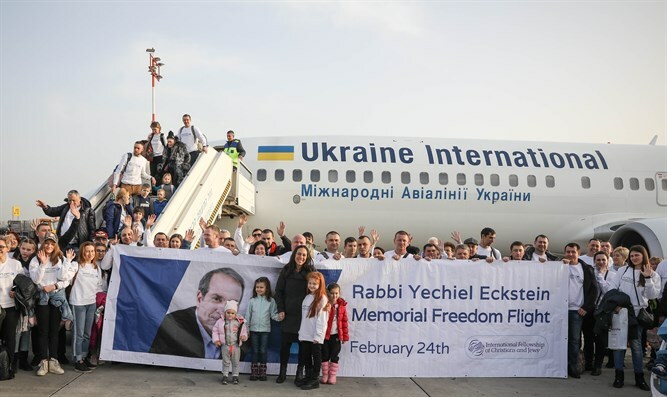 Two hundred forty-three new immigrants (olim) from Ukraine landed in Israel Monday morning on a flight organized by The International Fellowship of Christians and Jews (Keren L’Yedidut) and in the memory of its founder and former President, Rabbi Yechiel Eckstein. Against the backdrop of the recent passing of Rabbi Eckstein, the joy experienced by the olim on becoming new citizens of the state of Israel was diluted with a bit of sorrow. One of the 243 olim, 25-year-old Taisiia Borova, who dreamed so deeply about moving to Israel that she was willing to do so by herself and without family, expressed her deep appreciation to The Fellowship for arranging her aliyah. "I thank The Fellowship for all of its assistance. I knew about Rabbi Eckstein and the importance of his operations before even contacting The Fellowship. Unfortunately, I cannot thank him in person. However, I heard that his daughter, Yael is continuing in his path, and I am sure that she will succeed in this important mission. When it comes to helping from the heart, success is guaranteed." Borova visited Israel for the first time last year and had not stopped thinking about Israel ever since. She has completed her academic studies in the field of tourism and hopes to join the Israeli labor market very soon. Monday’s flight was arranged with the help of some Christian friends of The Fellowship, signifying that the organization is maintaining Rabbi Eckstein’s vision of a partnership between the Christian world and Israel. “We will continue to build a bridge between the Christian world and Israel,” Eckstein added. “This flight attests to the great effort our Christian friends are making towards ensuring that my father's dream of such a bridge is preserved and sustained." The olim came from a variety of cities including the capital Kiev, Odessa, Kharkov and Kirovograd. The age range of the olim span from as old as 88 to as young as a five-month-old baby. Most of the olim will settle in Haifa and Ashdod while the rest will move to Netanya, Rishon Lezion and Rehovot. For more than 20 years, the International Fellowship of Christians and Jews has been helping Jews to make aliyah and has invested more than $200 million in bringing approximately 750,000 olim to Israel. The Fellowship has also been a major contributor to the Jewish Agency and helped to establish the Nefesh B'Nefesh organization. In 2014, The Fellowship began operating independently in the field of immigration. Since then, The Fellowship has brought 17,000 olim to Israel from 29 countries around the world. The olim receive comprehensive assistance from The Fellowship including special grants of $500 per adult and $300 per child. The Fellowship also sponsors their flights to Israel and ensures that they receive the absorption basket that they are entitled to under Israeli law. Additionally, The Fellowship works to make sure that the immigrant families are absorbed within their respective municipalities, particularly with regards to housing and employment. Moreover, The Fellowship continues to advise the families even after their absorption process.